NEW YORK, NY--(Marketwired - Sep 17, 2013) - In today's technology driven society, you are what people can find about you online. Internet is the fastest, most popular and free way to look up information and ICMediaDirect.com delivers an ultra high standard in Google brand repair. "Being two years older than Google, we were able to develop a strategy focused on providing 100% control of search results for an elite individual or a high-end brand," said Vladimir Khomenko, ICMediaDirect.com CEO. Founded in 1996, ICMediaDirect.com is a full service PR and marketing agency with locations in New York City and Washington, DC. The premier company sponsors major marketing events and conferences including Affiliate Summit, Leadscon, SES, ad:tech, and New York City Fashion Week. Among the company's upcoming conference appearances are the New York ad:tech and Chicago SES scheduled for November 2013. 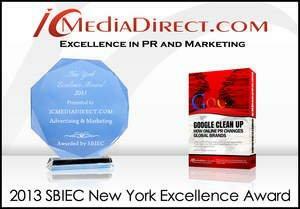 The Small Business Institute for Excellence in Commerce (SBIEC) has selected ICMediaDirect.com for the 2013 New York Excellence Award amongst all its peers and competitors. Each year the SBIEC conducts business surveys and industry research to identify companies that have achieved demonstrable success in their local business environment and industry category. ICMediaDirect.com has consistently demonstrated a high regard for upholding business ethics and company values, which is a trait seldom found in its industry. This recognition by SBIEC marks a significant achievement as an emerging leader within various competitors and is setting benchmarks that the industry should follow. ICMediaDirect.com is also a proud supporter of a number of organizations, including the Jewish National Fund, the AJC Global Jewish Advocacy, and the American Jewish World Service. The Jewish National Fund is a 109 year old non-profit organization committed to building for Israel's future and responding in the times of need. The AJC Global Jewish Advocacy was established in 1906 with the aim to work towards a world in which all peoples were given respect and dignity. The American Jewish World Service was established in 1985 as the first American Jewish organization dedicated to relieving poverty, hunger, and disease among people across the globe. The new ICMediaDirect.com website has recently launched with more features and services, including company's social media links and second book. In addition to its first book released in November 2007, "The New & Complete Internet Marketing Handbook," the company's second book titled "Google Clean Up - How Online PR Changes Global Brands" is now available for sale. The book details the art of repairing global brands' image online by providing 100% control of search results. With 18 years of experience, ICMediaDirect.com is an award winning online PR and marketing firm repairing global brands in 49 countries and 49 languages. Some of its clients include Fortune Top 500 CEOs, High-End Celebrity Jewelers, Olympic Gold Medalists, Politicians, Executive level Bankers, and Top Motivational Speakers. Our job is to connect these extraordinary individuals to their clients such as Jennifer Lawrence, Kim Kardashian, Vanessa Hudgens, Maggie Gyllenhaal, Justin Bieber, and Julianne Hough to name a few.